Leaving a trail browsing the web? Clean it using only Microsoft® Excel. Want to easily and fast clean all the records IE makes about your browsing? Every time you use your browser, it will register information about the pages you visited. This can be annoying and even misused. You can manually clear most of this information, but it is a time consuming process. There are commercial software around to clean it, but they are expensive and cannot be used on corporate PCs, where software installation is usually locked to end-users. Delete Internet Explorer's navigation trail on your PC (all records IE makes of what you've been seeing on the internet) as well as the recent file list of some common picture editing applications (Paint and Photo Editor), Windows itself and Windows Media Player. All at once in a single run! Cache – the browser local copy of the pages you visited, to make repeated visits faster. Delete all material copied from the web . Cookies - small files that include information about you and the sites you visited, for identification an tracking purposes. They are all deleted. Temporary Files - Whenever an application needs to extract files (like opening an email attachment, downloading a file like a video or when unzipping files), it uses the Temporary Folder as a workspace. As it names implicates, it should be temporary and they should be deleted after being used, but they don't. So it will accumulate, over time, copies of a lot of files you've used in the past. You would be surprised with what you could find here. 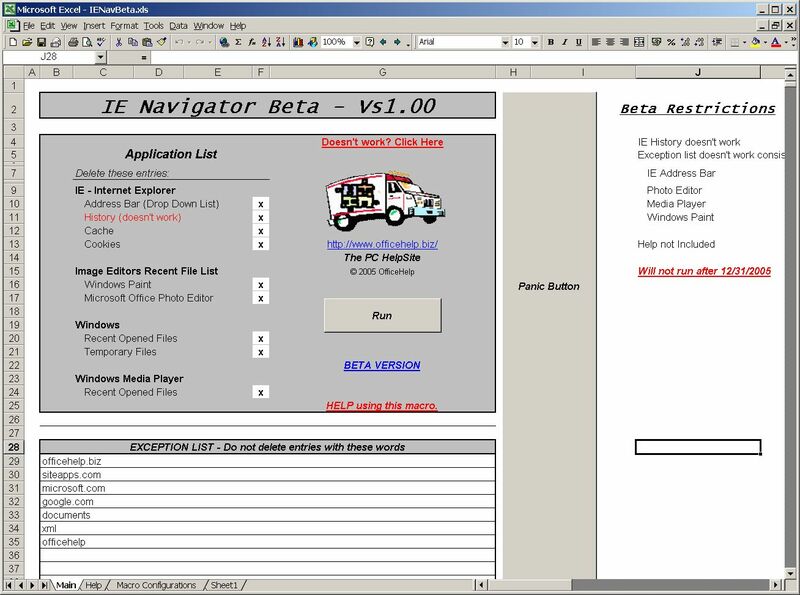 IE Navigator cleans it. Recent Opened Files - Windows audio and video player. 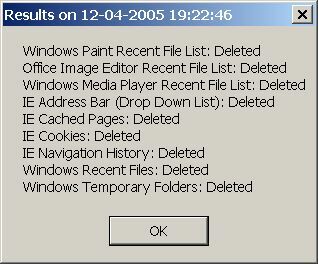 Delete the recent file list on the file menu that usually shows the last files played with this software. You can select / unselect each option to include / exclude on the cleaning operation. 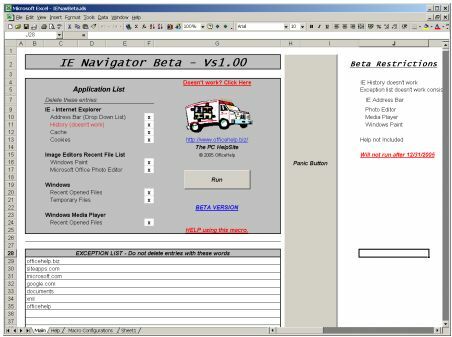 IE Navigator is an Excel Macro. Macros can be almost as powerful as standalone software, despite running inside Microsoft® Office applications, like Excel. Despite some limitations, they have a powerful advantage for common users: They don’t require installation. Just click the icon to open it in Excel. Click again on the “Run” button to clean the IE navigation trail. Installations are a source of problems. They don’t always go right, they seem to always break something that was already on the computer, they leave garbage behind even after uninstalls and they overcomplicate the process of running software. Why can’t you just click on the program to run it? With IE Navigator you can. Some it's very useful and saves time to have some entries on the browser address bar, or the recent file list. Also, if you want to protect your privacy, a clean list can be suspicious. People know you've browsed the web, but you always have a clean list. Would you buy it yourself? The Exception List allows you to select some website names or any other words associated with contents you want or don't mind leaving on the trail. Like visits to Google, or your corporate website. They will not be deleted, all others will. If you like privacy, you don't want other people noticing you're using a trail cleaning application. IE Navigator as a full length (can be used anywhere regardless of vertical scroll) Panic Button that , if pressed, will jump to a blank Excel sheet. You can improve the camouflage by copying your own Excel sheet there: a budget, timetable or whatever you have in Excel. This way, by pressing the button, the PC display will show your regular, everyday Excel sheet. There are two Help sheets on the Microsoft® Excel Workbook (PIC. 3 - The middle sheets). The first one is the general Help sheet, the second is the Macro Configuration one. There is also an Online Help Page for this product (see bottom of page for all related links). Download your FREE beta here! Beta applications are software products that are not considered ready for release, but already perform some or all of their intended tasks. They are released for free to get feedback from end-users. It is possible that there are other insufficiencies and bugs. This is a Beta product and it's not ready for commercial release. Please report here any problem with this Support Contact Us link. Just click on the link below to download the file from our website. It's that simple! Don't wait any more! Trying this easy to use application is FREE. Try it now!